← The Holocaust and The Armenian Genocide. Forgive and Forget? So, there I am, walking down Broadway, and who do I see but Mickey Mouse. Not the actual Mickey—he’s either passed on to the rodent afterlife or is living in a fancy retirement resort on a golf course in Nevada. The version of Mickey I ran into is actually a mini-carousel ride for little kids—costs a quarter…These kids have no history with him and couldn’t really register any particular cultural reaction to him. Now usually children—toddlers in this case—instinctively recoil from anything that is just plain wrong, but in this instance they give what seems to me to be the manifest creepiness of this creature a pass; it’s fun for them because they get to hear some garbled nursery rhyme set to a tune and the mouse rocks back and forth for about two minutes. I think part of the reason for the glowing, helium-buzz look in Mickey’s eye and the general feeling of dis-ease he engenders in me (and maybe other adults) has multiple explanations. First, he is about a thousand times bigger than a real mouse and dressed like a circus clown or a door-to-door vacuum cleaner salesman from the 1940’s. Ok, that’s ok… but it is inherently strange to see a two inch, two ounce creature inflated to (relatively) Godzilla-size proportions. It gives you pause. And with no intention of being xenophobic, the chances are also a hundred to one that this Mick was made in China or South Korea (occasionally the songs are sung by heavily accented Korean or Chinese children–or adults posing as children). This also elicits something of a cognitively dissonant reaction in me. Old Macdonald had a farm? Do the people recording this song in Seoul or Beijing have any idea what that could possibly mean? They could just as easily be singing Old MacDonald had a hedge fund. Or Old George Bush, he had a war–e-eye, e-eye-o. More than just the meaning of words gets lost in translation—whole ocean-liners of cultural significance sink beneath the waves. It could be, too, that as a kind of demi-god (after all, he is a giant multicolored rodent) something else has been mislaid in the cultural translation. All cultures have their particular “pagan” spirit representatives; Native Americans had Raven and Coyote, and Greek mythology was chock full of such manifestations. The Chinese and Koreans have rich, ancient traditions of imps, demons, spirits gods and goddesses masquerading in animal form—and not always with benevolent intent; tricksters who steal and mislead and cause humans to wander off the path of civilization. Maybe because Mickey Mouse and everything he represents about America is so foreign that they (the manufacturers of this mini-carousel ride) don’t get that he carries a train-load of the same universal cultural DNA that is inherently frightening or repellent to all humans. But, so what–what’s more important here is, of course, the bottom line. It’s all business. This particular rodent was and is big business. As a cartoon character/icon, he still leads the Disney corporation in revenue production, bringing in maybe a billion a year. Why do people all over the planet come to these places? 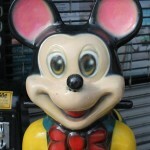 What powerful attraction does this mouse possess that is so easily able to pull the dollars, euros, yen, shekels, and pesos out of people’s pockets? Maybe the mouse who showed up during the depression and cheered people then is doing the same now for people in an overwhelming, inhuman and brutal world. Or maybe just spending money on a brand is something people do automatically now without even understanding what they’re doing. Still, just because I find Mickey Mouse revolting and scary doesn’t mean that he hasn’t got some enduring universal appeal to children; something that just tickles them in their child hearts. Whatever that tickle is, I never experienced it. I never could stand him. I didn’t like him when I was kid (though God knows I was in desperate need of cheering up) and I’ve had no change of heart as I grew older—not even when his old cartoons were issued in a form my own kids could watch. To me there was (and is)—particularly in his carnival ride incarnation on Broadway—something at the very least hysterical about him, if not actually psychotic. He gives me the creepy feeling that there is a killer dwarf trapped inside him. When Mickey spoke in that squeaky, high-pitched voice of his, he seemed unmanly to me. I know, I know, he was only a mouse, but maybe I was influenced by the old saying: “Are you a man or a mouse?” It all seemed sick and wrong… Here was a putative mouse, yet it was dressed as a man, with a girlfriend (or was Minnie his lawful wedded?) and speaking as a man. It was confusing. who wants the job of picking up the football team’s jockstraps. Also, I didn’t like him cozying up to Annette Funicello on The Mickey Mouse Club show on TV. I know what I was feeling for Annette but what did this little rat Mickey have in mind for her? It made me angry and sick to think about it. Oh well, what’s the difference. Little kids don’t care. They love the short rocking-horse type ride and the sing-songy music. It doesn’t make any difference to them if it’s Mickey Mouse or Attila the Hun. See, right there’s the purity of childhood as opposed to the muddy doubts and complexities (not to mention neuroses) of being a grown-up.